History: Lady (no spiders for this girl) is an Iowa girl that made her way to Texas. 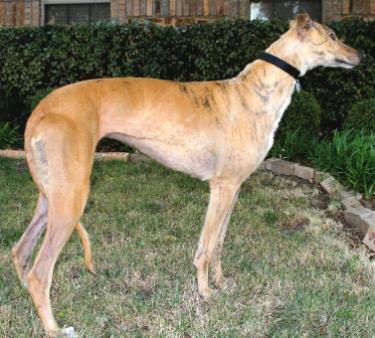 She raced all of her 53-race career outside of Texas but decided this is a good place to retire. She had a big day on her first day in Dallas. We will know more about her personality in a few days. She needs a little time to unwind. The one thing that is immediately obvious is that she loves to be petted, and it won’t take any time for her to get used to human attention. 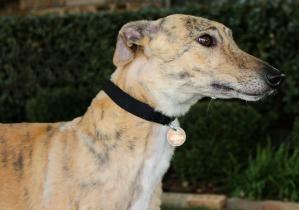 Lady adopted to Joe and Joanne and greyhound brother Casey. 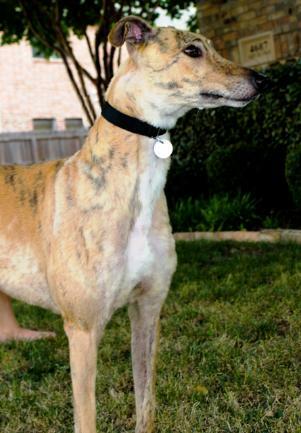 June 24, 2012 update: Lady was adopted to her loving, lifetime home and has an older Greyhound brother named Casey. 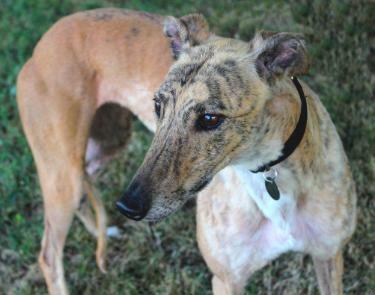 June 14, 2012 update: Not only is Lady beautiful, calm and sweet, she is also very smart. After inspecting the house the first day she settled herself on the floor, rolled over as if to say my tummy needs love. She is the perfect house guest! Never an accident lets us know if she needs to go outside or just wants more patting. She is never very far away from either of us, always following or just keeping an eye on us to see if she is needed. She knows her name and loves to meet children and strangers so they can admire how calm she is as well as her outstanding markings. She is not afraid of thunder, instead, she barked back. She has a great voice to sing along with sirens but not for long. Did I say she is funny? Yes, she is. She will play with a squeaky, floppy toy, wear herself out and fall asleep with her head on it for a pillow. No problems getting her to sleep at night in her crate. During the day she has had a nap in the crate with the door open all on her own. Lady is not crated during the day if we are gone for a few hours. She is easy to bathe and even have her nails clipped by me by myself. Being a professional racer she does still have strong prey instinct for cats, rabbits and squirrels. She loves car rides and walks. We are working on the leash pulling and loading into a vehicle and she is making progress on both, in less than three weeks. She is ready to bless you with love, fun and companionship. Brace yourself to fall in love and give her a forever home. 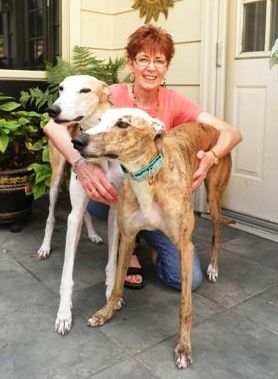 May 24, 2012 update: Lady came to TAGS to find her loving lifetime home.